Regulating quality and standards in higher education: How does Australia stack up? 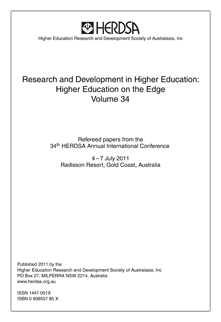 VET in Higher Education: A future for regional Australia? The casual approach to university teaching; time for a re-think? Extended professional experience; Does the ‘Edge’ and the ‘Value Added’ outweigh the burden on Teacher Education programs? Academic English – who sets the rules?